Food banks are perhaps one of the most noble community action agencies that exist; collecting and providing valuable nourishment for those who are less fortunate. As the holidays quickly approach, it’s important for administrators or food bank employers to make sure they are financially prepared for the rush of business. This includes making sure they have the right insurance policies in place. First off, it’s imperative that your food bank clients have a general liability policy in place, if for at least basic coverage. General liability insurance pays for lawsuits and their related expenses when a third party sues the organization claiming it damaged their property, reputation, or persons. Third-party lawsuits are filed by non-employees. This includes; vendors, contractors, clients, volunteers, and patrons or customers. Another vital coverage for food banks, in addition to their food ministry, soup kitchen, and food drive relatives, is property insurance. Many nonprofit administrators mistakenly assume that their general liability policy will take care of everything, but this is not the case. Commercial property insurance will reimburse your client’s organization when its property is lost or damaged in certain scenarios, which is not something general liability will cover. Covered property would include any equipment, inventory, office space, and supplies owned by the food bank, and property insurance will protect against fire, burglary/theft, vandalism, and certain weather events. 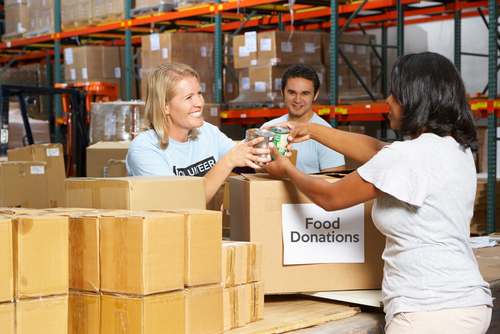 Working or volunteering in a food bank often requires lifting, bending, and otherwise fast-paced work. As a result, accidents occur. This brings us to the next important coverage for food banks; workers compensation. Workers comp can pay for your client’s legal and medical expenses when a worker is injured or made ill on the job. Expenses could include; lawsuits, employee medical bills, employee wages for the period they were unable to work, and more. These are not the only coverages your food bank clients should look into; however this is a good basis. With Care Providers Community Action Agencies coverage, we offer a broad scope of coverages for Food Banks and more. Please contact us today to learn more at (855) 652-6876.